Affinity Photo is a really good software (except for the constant crashes). But it still lacks a simple basic and very important feature: BRUSH OPACITY CONTROLLED BY PRESSURE. If this option is somewhere hidden, please tell me. Oh and I don't accept that using pressure for the "Flow" option is an alternative. Common guys, many simple and free softwares have this: Krita, Gimp, Blender, or simple and cheap softwares like Artrage. I know this software is not made for digital painting, but I don't use it for that. I use it for render post processing, which is the same as phothography editing. And opacity pressure is very important to softly change masks, to add a bit of overlay or color dodge. So, (maybe someone already made this request) my suggestion is to simply add an opacity pressure button, just like the one Photo already has to control brush size, right beside it. We recommend trying Flow Jitter at 100% set to pressure and Accumulation Jitter between 30%-50%, to closely mimic PS opacity on pressure! When I try this. Nothing changes. Pen pressure still controls brush size. The settings look OK when I go back to check them. What am I doing wrong? I'm on the latest version of Affinity Photo and the latest version of MacOS. 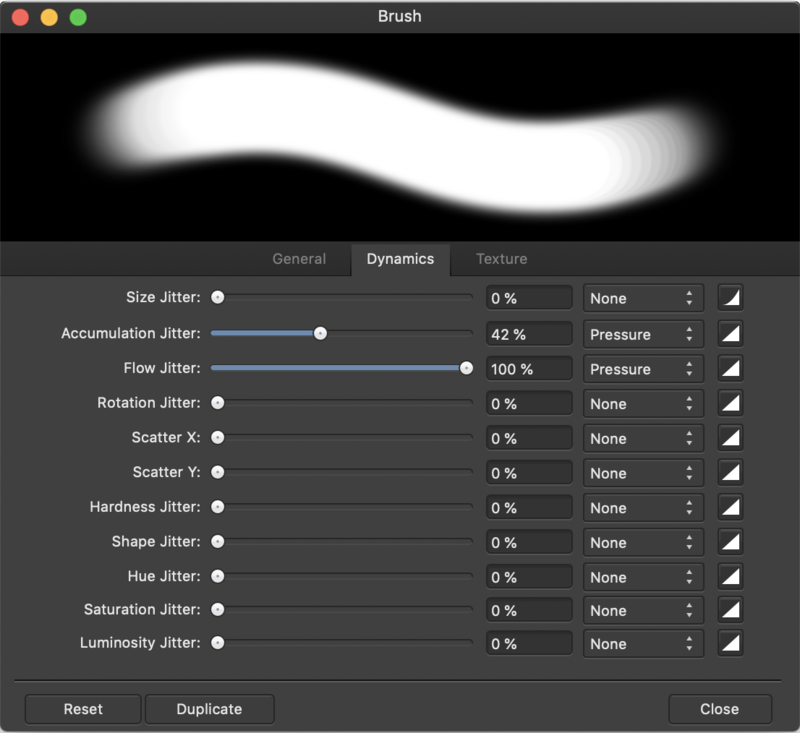 Could you provide screenshots of your brush settings please? Please make sure this setting is set to off, otherwise pressure will always control size. Does this fix your issue? Yep that would do it! Thanks! !